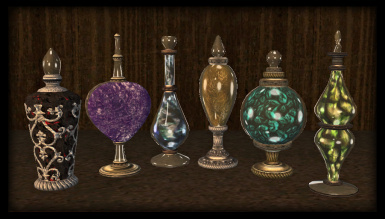 This mod replaces the generic potion bottle with 108 new and original bottles. 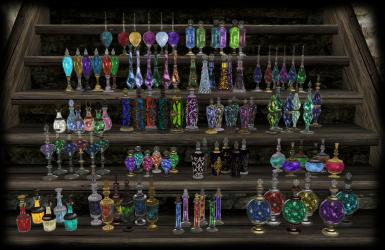 This mod replaces all the generic bottles used for potions with new bottles and new inventory icons. The wine bottle replacer is now in a seperate esp file, (Alluring Wine Bottles), which is included in the download. It is also available as a seperate download. 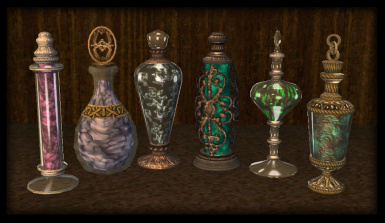 - Ale, beer, mead, skooma, and, wine bottle replacement has been removed. 1) Extract this archive to any folder and then copy the contents to Oblivion's Data folder. 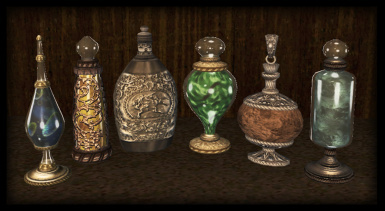 If you have an existing "meshes" folder in your "Data"
2) Start Oblivion Launcher, click Data Files, and enable "Alluring Potion Bottles v3.esp"
You may use the bottles any way you like, just don't claim them as your own.